PHUKET: “Tuptim” is only seven months old, but has a condition that requires an urgent liver transplant or she will die within weeks. She is the daughter of Rattanachai “Kru Nai” Jadngooluem, a well known trainer at Tiger Muay Thai (TMT) in Chalong and a former World Muay Thai world champion. 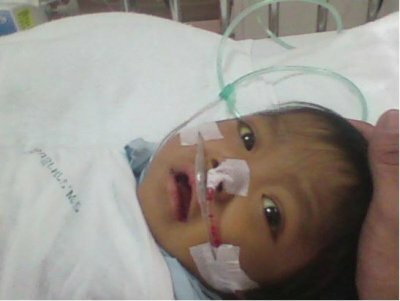 Mr Rattanachai, “Nit”, the child’s mother, and Phuket’s muay thai community now face the fight of their lives as they look to raise the US$50,000 needed for Tuptim’s life-saving surgery. At three months old, Tuptim was diagnosed with biliary obstruction, which means there is a blockage in the tubes that carry bile from the liver to the gallbladder and small intestine. She was this week admitted to the intensive care unit of Ramathibodi Hospital in Bangkok after suffering internal bleeding. She remains in critical but stable condition. Doctors at the hospital believe without adequate and immediate medical attention Tuptim will not survive to see the new year. The only option to save her life is a parental donor liver transplant – a complicated 10-hour procedure where a portion of the parent’s liver is removed and placed inside their child. If the operation goes ahead it will be carried out by world-renowned Bangkok based specialist, Dr Sumate Teeraratkul. Grainne Farrell, managing partner of Lotus Medical International, is heading up the fund-raising team. “I was asked a while ago by a wealthy benefactor to find out if there was any medical treatment that could save Tuptim. At that stage Tuptim had been told…that she basically had to wait to die. They could operate on her but there was only a 30% chance of survival,” said Ms Farrell. “I decided to ask my friends for help. I train at TMT and within less than 24 hours I had a group of people willing to help. The work that they have done in less than 24 hours is totally amazing,” she added. Some of Thailand’s most famous muay thai fighters are donating signed memorabilia for an online auction. The Yoonique bar in Nai Harn is to host a special party on December 24 to raise funds and TMT has organized a BBQ for December 25 at their training camp in Chalong.